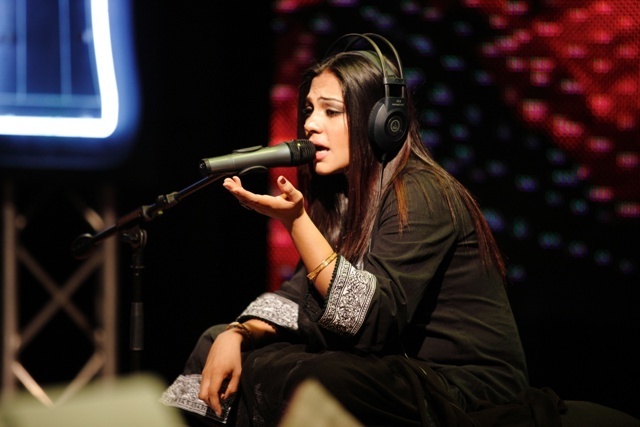 Sanam Marvi was born in Hyderabad, Sindh, Pakistan to Faqeer Ghulam Rasool, a sufi singer. She had eight siblings. She started training at the age of seven and used to accompany her father to his performances at various shrines of sufis in Pakistan, including Sindh and Punjab. She later trained under Ustad Fateh Ali Khan of Gwalior. Sanam Marvi debuted at ‘Virsa Heritage’, a programme on PTV. She became popular after her performance Sighra Aaween Saanwal Yaar by Sanam Marvi coke studio season 4 at Coke Studio, a Pakistani television series featuring live music performances. She performs sufi concerts around the world. She is among the finest performers in the Sufi, ghazal and folk genres She sings compositions of Baba Bulleh Shah, Baba Sheikh Farid, Sachal Sarmast, the Sufi mystic from Sindh, Shah Abdul Latif Bhittai. She made her debut in with a solo performance at 2010's Jahan-e-Khusrau, the Sufi music festival. In February 2011 she performed with Indian playback singer Rekha Bhardwaj at Times of India's Aman ki Asha at Chowmahalla Palace, Hyderabad. The purpose of CokeStudioIndia.blogspot.com to launch, promote and to support innovative music and media, provide the users with information and other material relating to music, their favorite artists and other topics. I at CokeStudioIndia.blogspot.com am not aware of any copyright or trademark violations on any of my websites. I strongly believe in the sanctity of copyrighted and trademarked material and if any violation of copyright or trademark on any of our websites is brought to my notice, I will gladly review it and if found to be in violation, I will remove the offending material from my website. Any music files present on my website is the property of the artistes, their producers, recording houses etc. I am in ‘NO WAY’ claiming any credit or ownership of any music files present on our websites. My only purpose is to promote music and allow you to sample some of the songs as a means to encourage you to buy the songs/albums that you like.